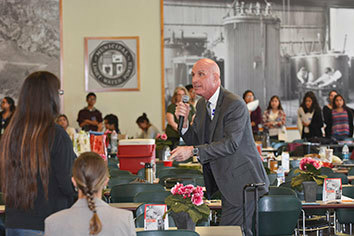 Due to the success of the Options Enrichment Program, Mr. Cathers developed HIPP to provide teacher training and student workshops for Academic Decathlon teams at high schools in Los Angeles. In 1994, HIPP launched its pilot program in three LAUSD Title I high schools with the assistance of a grant. With the subsequent support of the LAUSD, the program quickly grew to more than thirty schools, and HIPP schools became a dominant force challenging Academic Decathlon teams throughout Los Angeles, California and the United States. The following describes the dramatic and measurable success of high schools that have participated in HIPP. 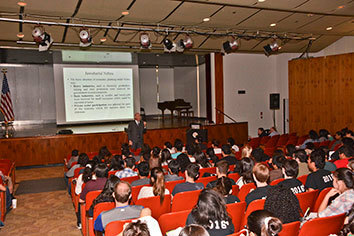 Imagine urban high school students crowding their way into HIPP Workshops after school, on Saturdays, and during holidays and summer vacation for intensive academic preparation within a pleasant and safe environment sponsored by the professional sports franchises and universities in the heart of American cities. Imagine distinguished educators, teachers, professors, scientists, economists, business leaders, technology innovators, musicians, artists, and tutors bringing their expertise to HIPP workshops to insure that every student in HIPP has access to quality instruction and learning on a regular basis in every subject, instead of allowing these students to be limited by the capacity of their regular schools. Imagine these students developing the intellectual and moral habits required for succeeding in school, living a good life, fulfilling the responsibilities of citizenship, and pursuing life-long learning regardless of college or career paths. Imagine these students also excelling in the Academic Decathlon competition, World Scholar’s Cup, Science Bowl and passing multiple Advanced Placement tests in a variety of subject areas; and not only being admitted to a variety of colleges, universities, and vocational schools, but succeeding in these endeavors and beyond with continued support from HIPP. Imagine the “preparation gap” between HIPP students and their counterparts at highly rated schools in affluent areas not only being ameliorated, but obliterated. Imagine these students also learning how to build a diversified investment portfolio, winning contributions to their portfolios for academic achievement, receiving ongoing financial planning and mentoring throughout college, and becoming responsible capitalists as well as citizens in adulthood. Imagine teachers from local urban high schools eagerly receiving training and professional development at HIPP Workshops and in their classrooms to improve the quality of instruction available to all students on a daily basis “within the bell” of the traditional school day. Imagine these students utilizing the latest technologies at HIPP workshops as effective means for learning, along with the assistance of tech personnel and expert teachers who assure that the technological tools are operative and efficacious for learning. In this era of constant change, technology at many schools is rapidly antiquated or doesn’t work due to economic limitations. Furthermore, personal technology given to students can render them targets for robbery while in transit or in public. HIPP can provide a safe environment for students to utilize innovative, functioning technology fine-tuned for learning. Imagine qualified college counselors providing additional support to insure that each HIPP student has the necessary guidance concerning finding and applying for colleges, universities, and vocational schools that best fit his or her needs. Imagine elementary and middle school students attending HIPP to Read summer camps led by expert teachers and HIPP high school students who guide the younger students through Socratic Seminar discussions of Great Books along with intense coaching in reading, writing, and speaking. There is a renaissance blooming in downtown Los Angeles. Old buildings are being restored to their former grandeur and converted into living space for a new generation of residents rediscovering the historical core of the City of Angels. Sparkling new architecture grows rapidly providing innovative, modern homes to complement the old. This is, of course, the essence of a renaissance—the rediscovery of the past inspiring initiative and innovation in the present. Much of the energy of the Los Angeles renaissance is provided by L.A. Live, a multi-faceted destination featuring entertainment venues, restaurants, commercial and residential spaces, television and radio broadcast studios, and concert spaces. L.A. Live also contains the Staples Center, a multi-purpose arena that is home to the Los Angeles Lakers and Clippers of the NBA, the Sparks of the WNBA, and the Kings of the NHL. A renaissance, however, is more than architecture and entertainment; it is a spirit that permeates a place in time. Thus, business, the arts, education, and the culture at-large are presented with a unique opportunity for renewal and reform. The most critical aspect of any renaissance, however, is a significant surge in intellectual and educational achievement. Why is education key to prodding a fledgling renaissance into full maturity? Because re-birth is rooted in intellectual, ethical, and spiritual growth, not merely in buildings and play. Most important, a renaissance in the midst of a pluralistic democracy has the added responsibility of insuring its energy and opportunity reach all sectors of society. If gentrification is the sole offspring of the rebirth of our cities, then our democracy will be damaged and conflict will reign. Consequently, the renaissance of the city must employ profound and potent strategies for diffusing learning and opportunity throughout the polis. A renaissance in education that utilizes the growing wealth and wherewithal that is emerging in our cities is critical to fulfilling this purpose. The creative energy of a renaissance, however, will eventually dissipate, and the opportunity for launching new educational institutions that survive beyond the present burst of activity will have passed. Consequently, The Future Is Now for establishing a HIPP Educational Center in the heart of L.A.’s blooming renaissance. Imagine a HIPP Education Center located adjacent to the Staples Center and L.A. Live where disenfranchised students from a variety of urban schools are empowered with opportunities for intellectual, moral, and economic development. Imagine HIPP Education Centers emerging in cites across the United States each sponsored by professional sports franchises and universities. Imagine the renaissance of our cities spurring an American Renaissance! Contact William Cathers about supporting HIPP and/or bringing HIPP to your city!